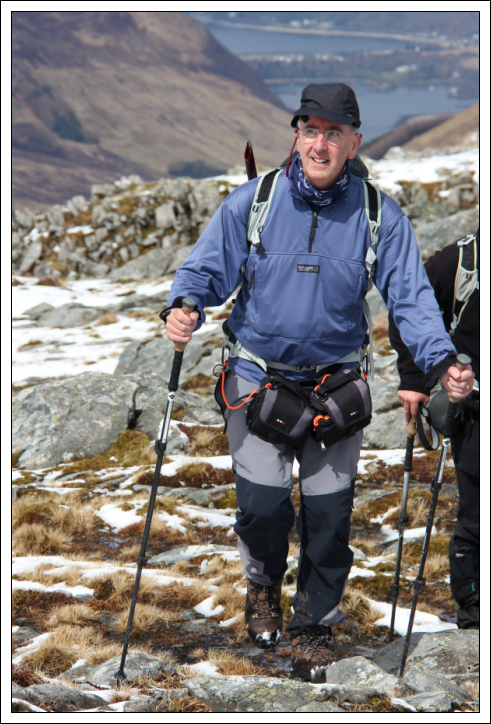 Yesterday morning, I set off walking from the Clachaig Inn with a number of friends and family of Hendo, to ascend Hendo's final Munro, Sgor na h-Ulaidh. At the Signal Rock car park, we met up with more of our group and gathered together for a number of group photos. From the Signal Rock car park, we continued a short distance along the road before taking to the vehicle track along Gleann leac-na-mhuidhe. 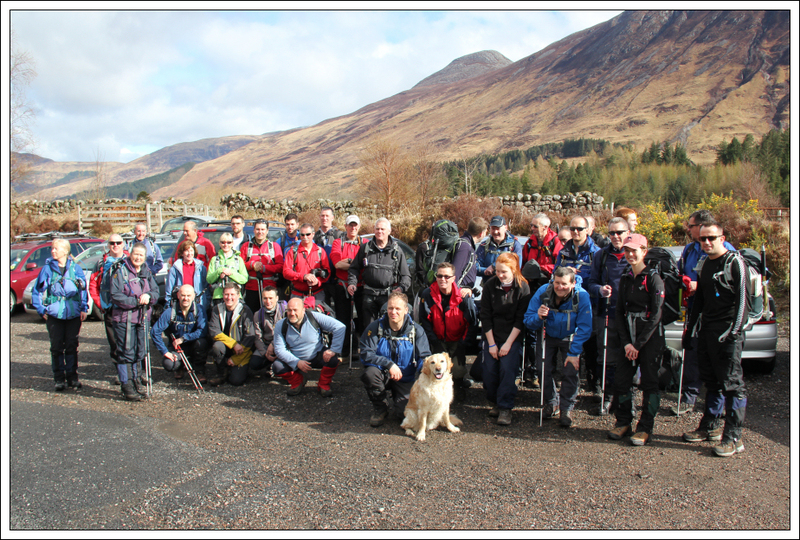 There was a vast wealth of experience within the group - multiple Munroists present and multiple Corbetteers present, including Molly the only dog to have completed all the Corbetts. 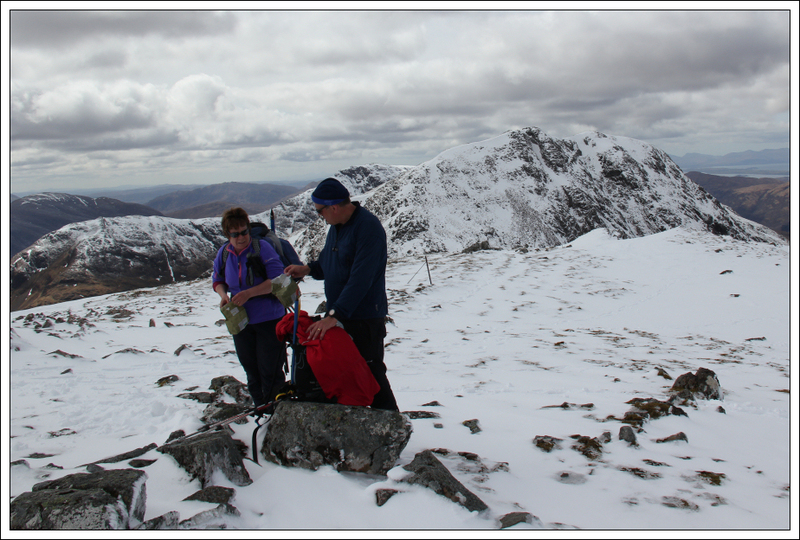 At the opposite end of the spectrum, for some this was going to be their first ever Munro . 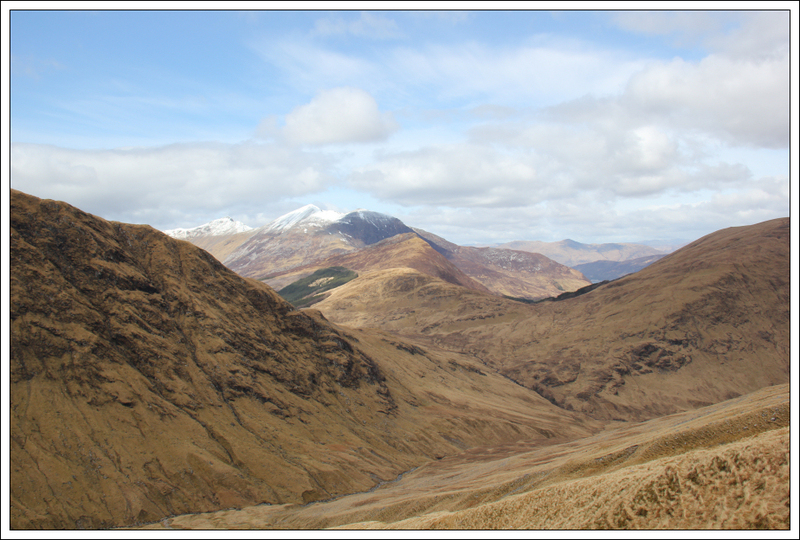 The walk along the glen was really pleasant. It was nice to walk and talk with so many people. 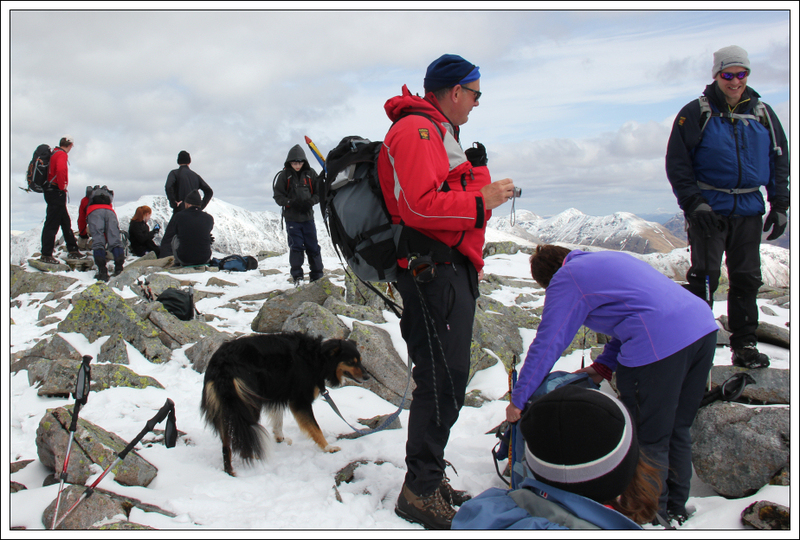 I was a bit worried as to how well Beinn would behave walking in such a large group as he is used to mostly walking with myself only. He seemed to enjoy the company and the attention . 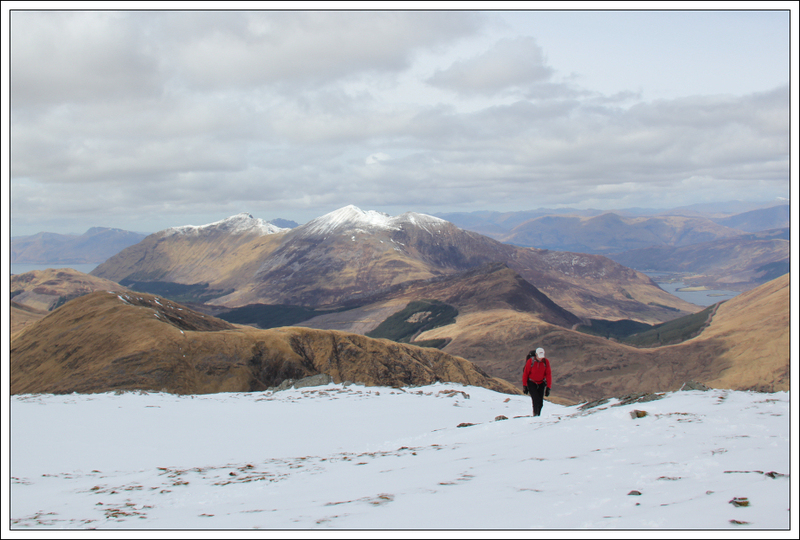 On catching my first glimpse of Sgor na h-Ulaidh, there was more snow on the hill than I had been expecting. After walking circa 4km from the car park, we stopped for a short break to allow the party to re-group. 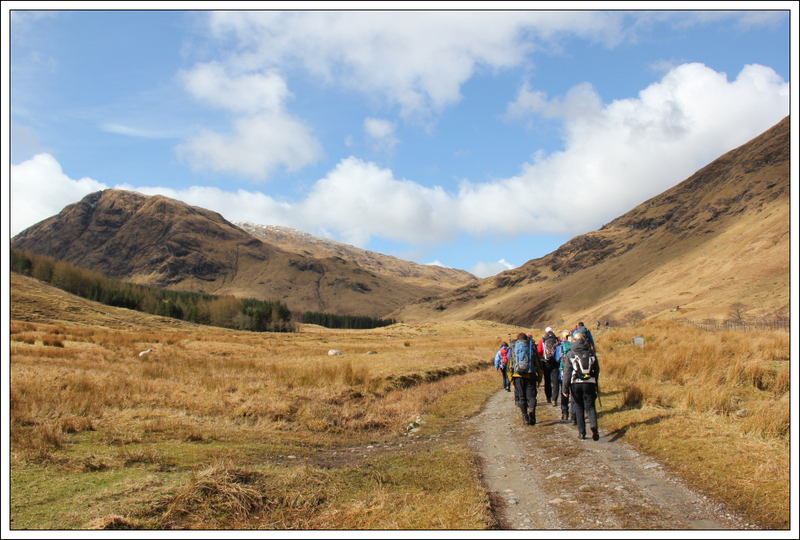 With the differing fitness levels, the group was already spread out at least 0.5km. As we continued along the path, I heard someone shouting and whistling to those ahead, You're going the wrong way. I have no idea what this was all about, as there is no right and wrong way up a hill. The SMC route is not necessarily the 'right' way. Anyway we all took to the hillside, on being instructed to do so . 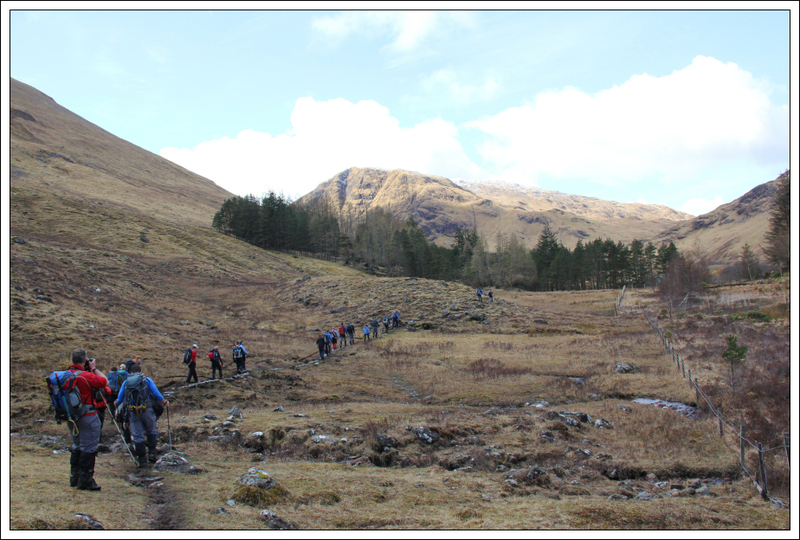 The steep grassy slopes were definitely a bit of a knee-killer and it wasn't long before the group started to really spread out. 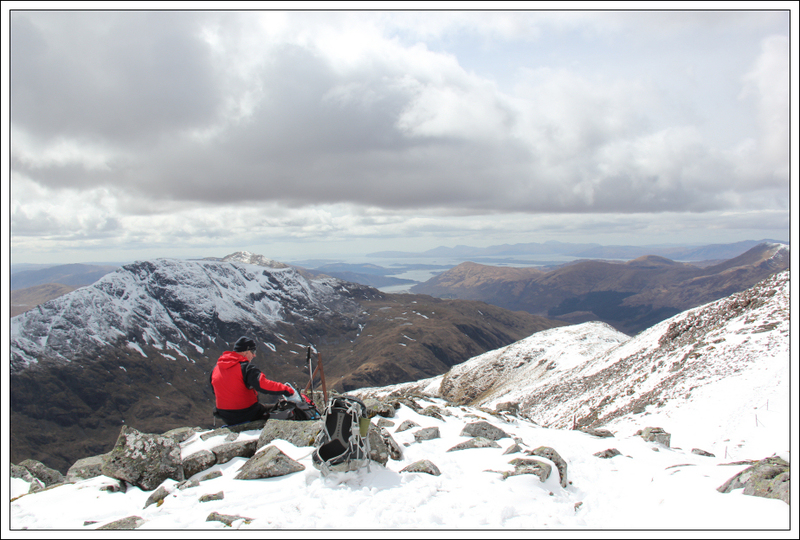 As I made my way up the slopes of Aonach Dubh a'Ghlinne, I knew I had plenty of time to kill and so made for the top of Aonach Dubh a'Ghlinne. 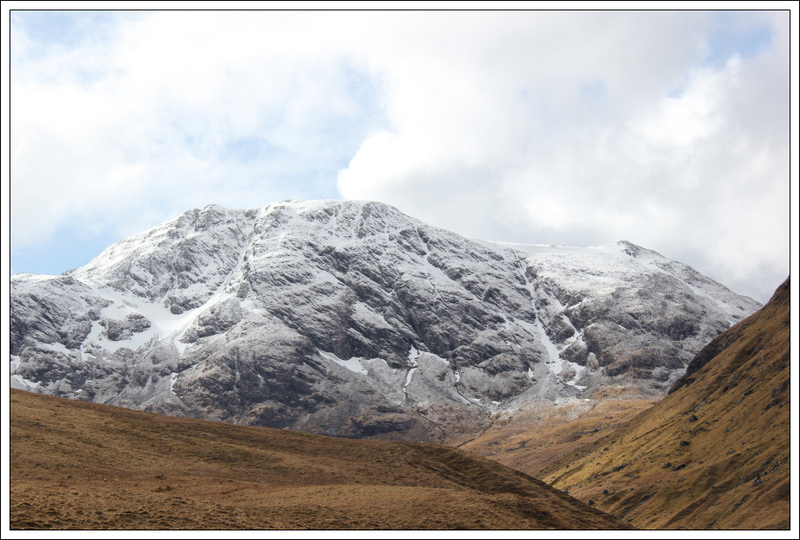 Aonach Dubh a'Ghlinne looks a fantastic peak from the A82 roadside. It is not however on many hill lists. 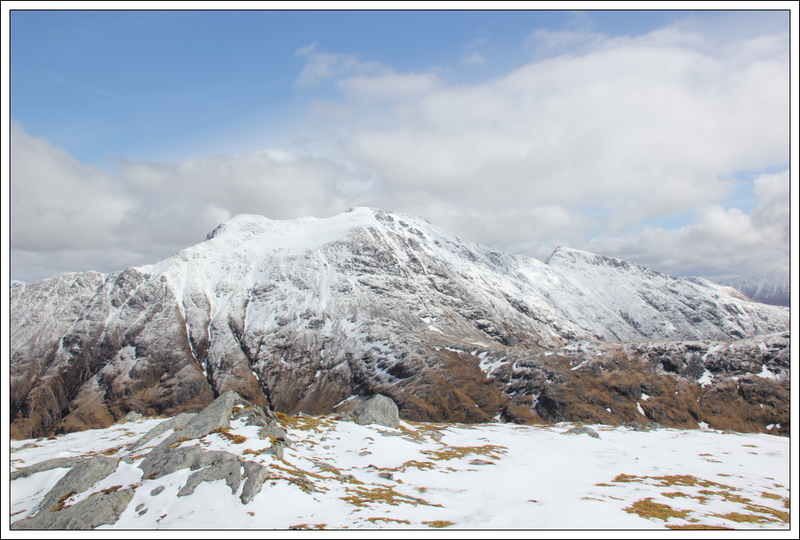 It is just a Corbett top of the Munro Sgor na h-Ulaidh. 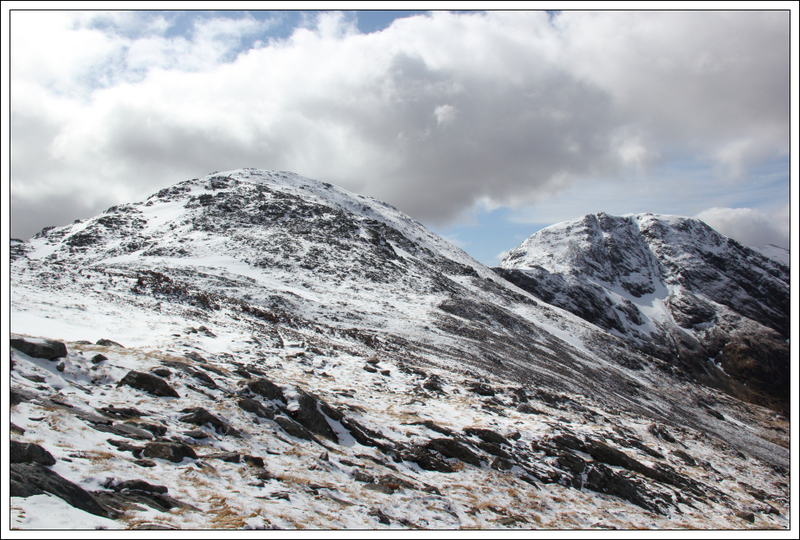 As I approached the top of Aonach Dubh a'Ghlinne, I was well impressed with the view across to Bidean nam Bian. 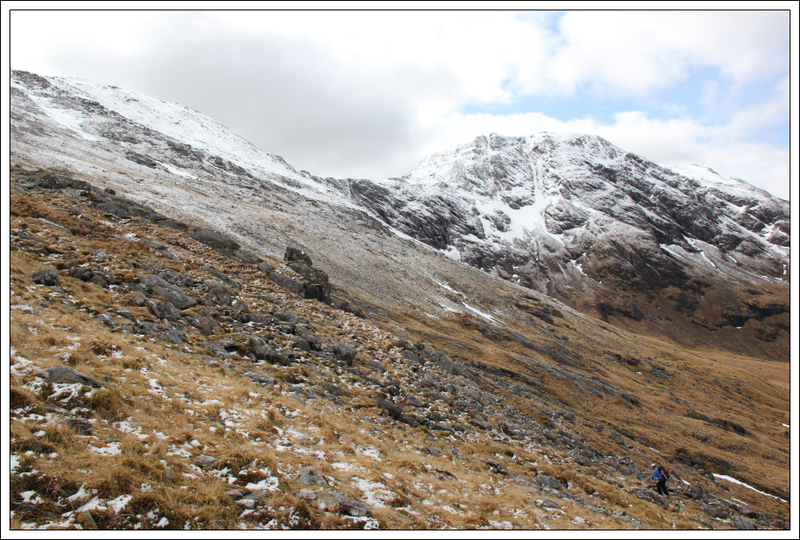 Bidean nam Bian was my final Munro although on the day we ascended it, it was a day of rain and low cloud. 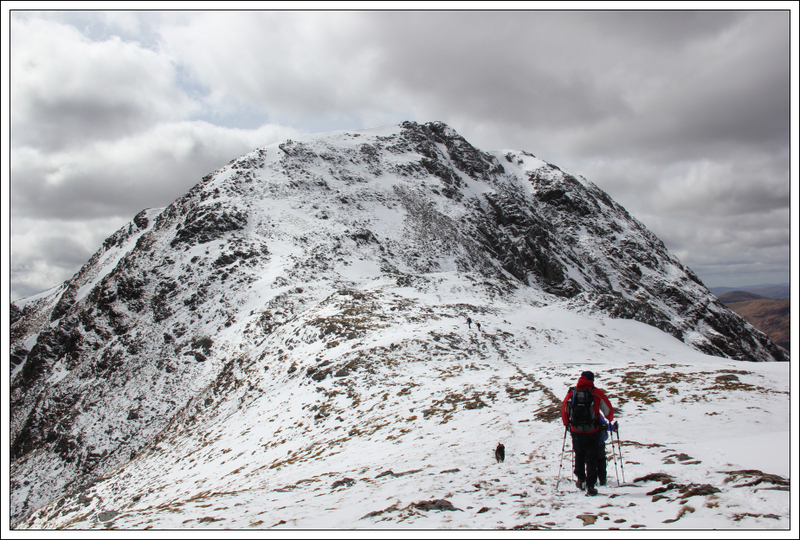 Bidean nam Bian is a hill I really want to do again on a blue-sky day. From the top of Aonach Dubh a'Ghlinne, myself and Beinn descended to the col between Aonach Dubh a'Ghlinne and Stob an Fhuarain, where we re-joined the group while waiting for a good number to still reach the col.
After a drink and a bite to eat, we began our ascent of Stob an Fhuarain. The snow was soft and fairly shallow. 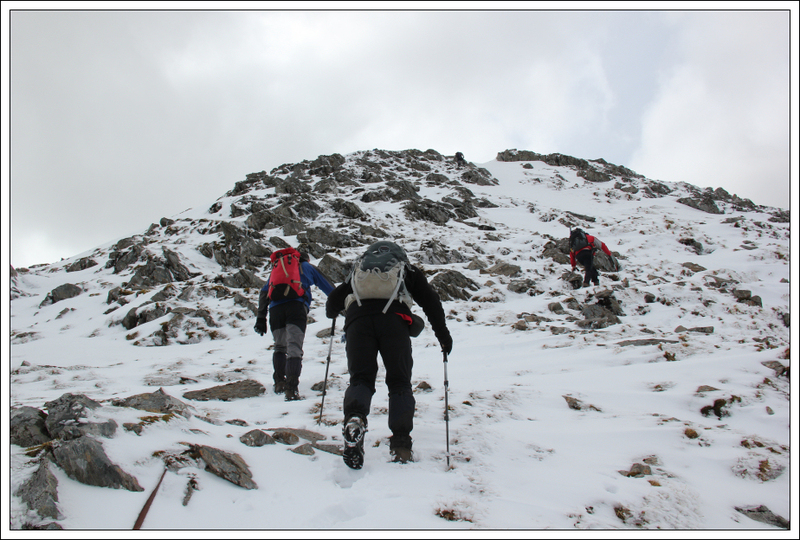 On reaching Stob an Fhuarain, which is a Munro Top of Sgor na h-Ulaidh, we stopped for only a few minutes before continuing onto the main summit. 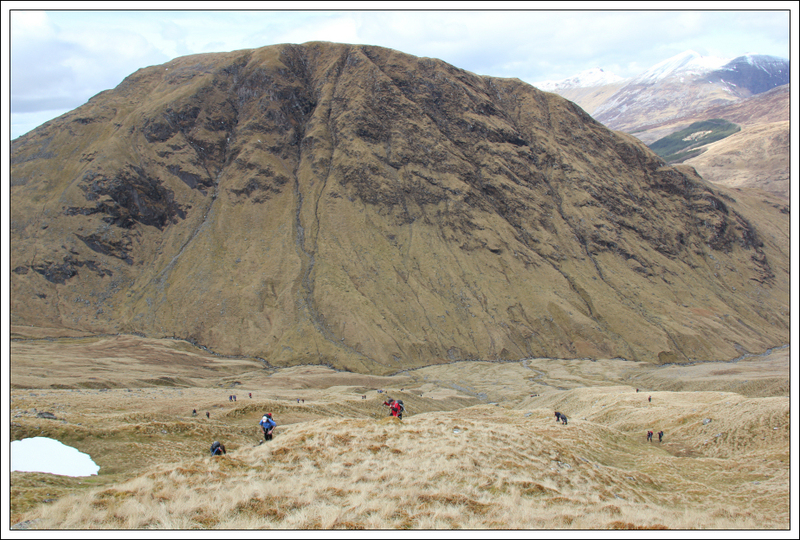 The 103m drop between Stob an Fhuarain and Sgor na h-Ulaidh makes it a HuMP as well as a Munro Top. 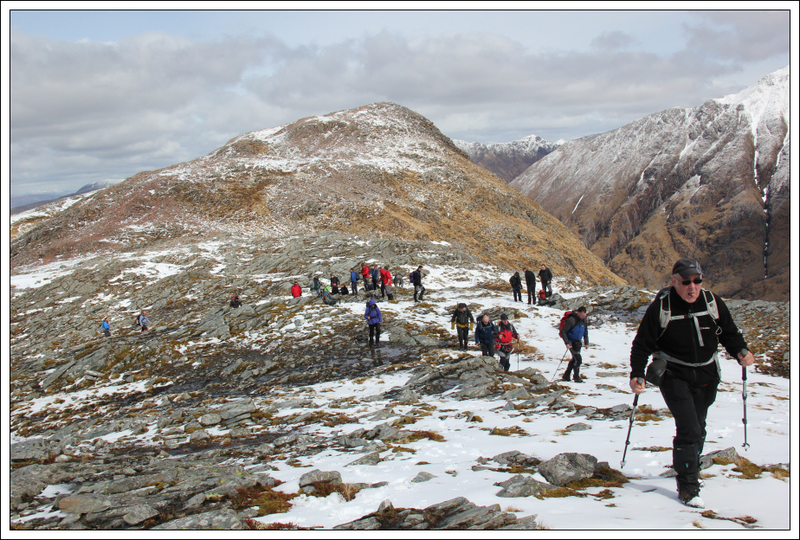 From the top of Stob an Fhuarain, the ascent of Sgor na h-Ulaidh looked very steep and tricky. 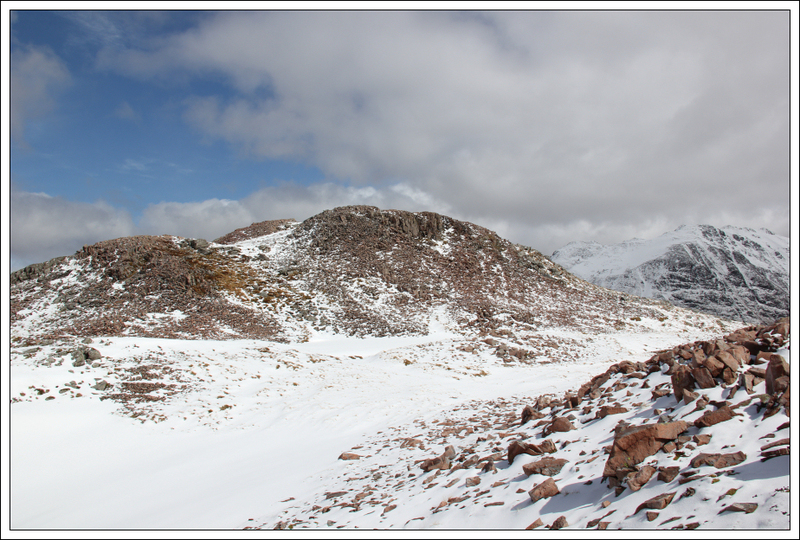 I was feeling a bit apprehensive about taking Beinn up such a steep snowy slope. 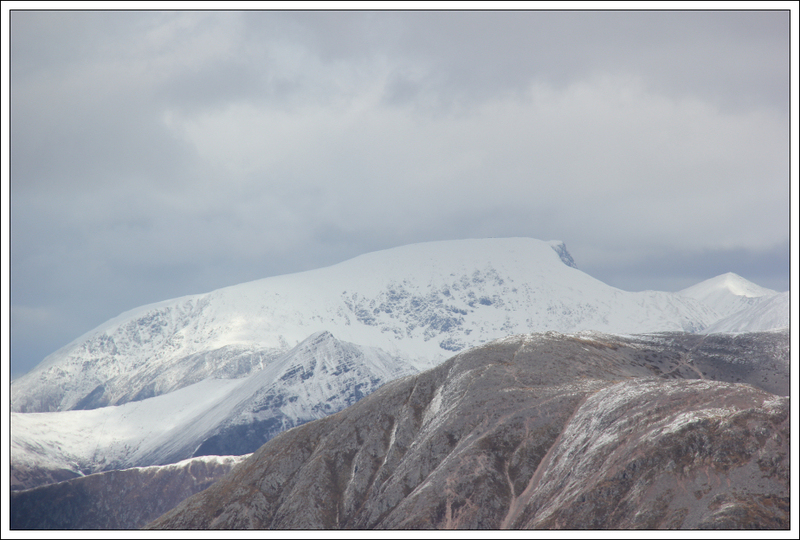 However, as is often the case, the nearer you get to a hill the easier it begins to look. 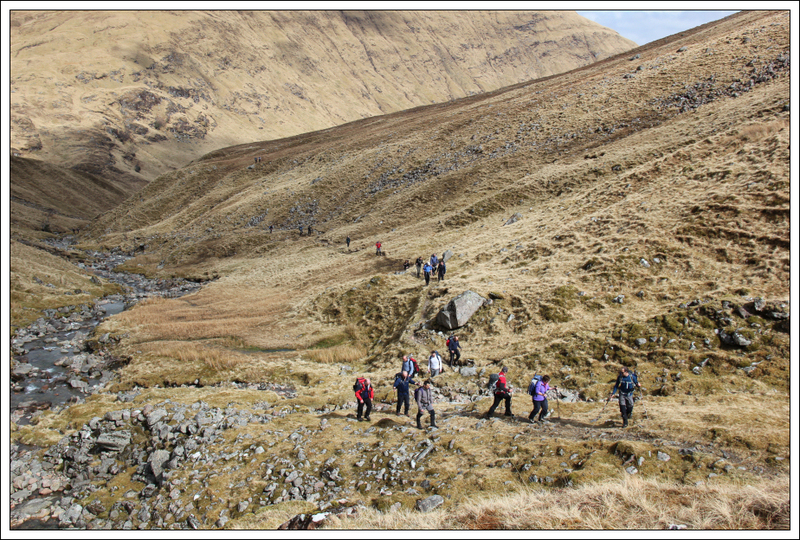 The ascent was fairly straight-forward but definitely steep. 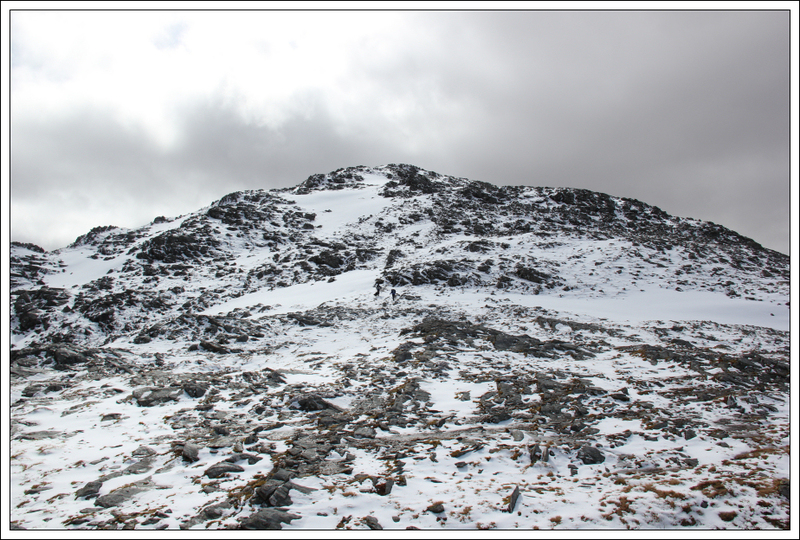 I got my axe out for the steepest section and decided on the way up that I would definitely be putting on crampons for the descent if going back the same way. 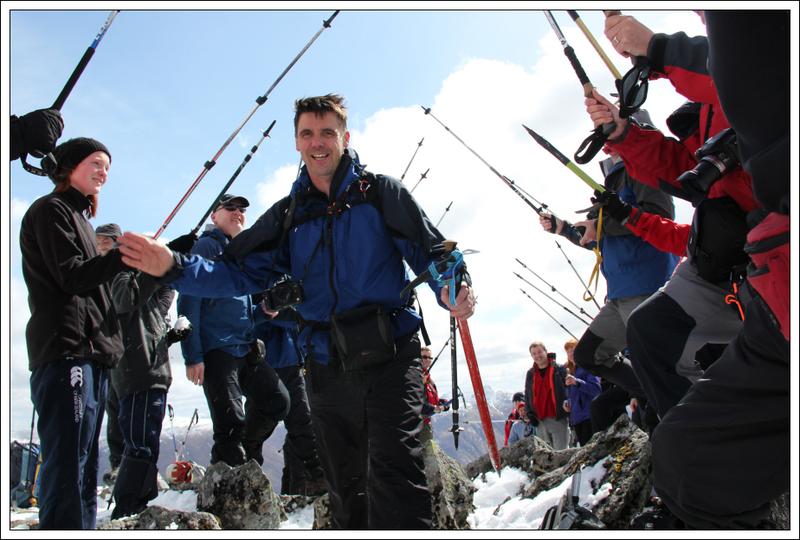 On reaching the summit, I visited the summit cairn with Beinn then got out of the way to make room for the large group reaching the summit. 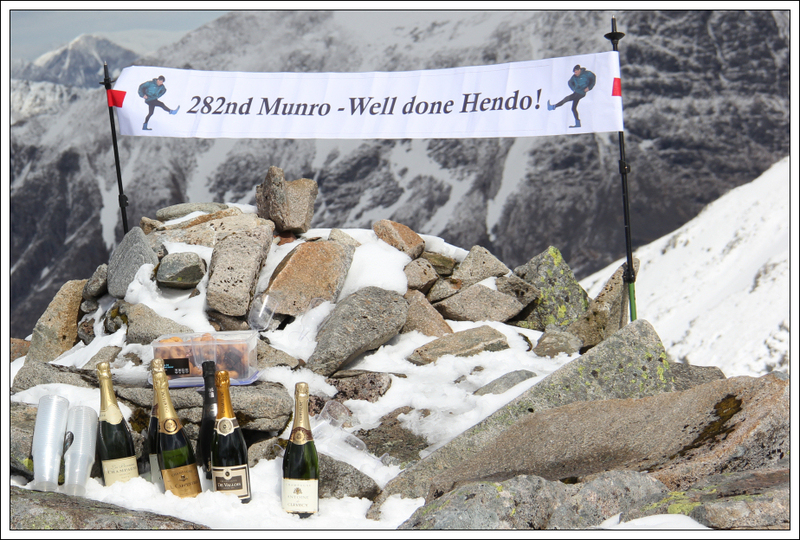 Robin and Will had already reached the summit by the time I arrived and had erected a superb banner for Hendo. It was great just to sit and spend considerable time at the summit. This is something I rarely do, as I usually just touch the top and continue on. Spending lots of time up there was nice! 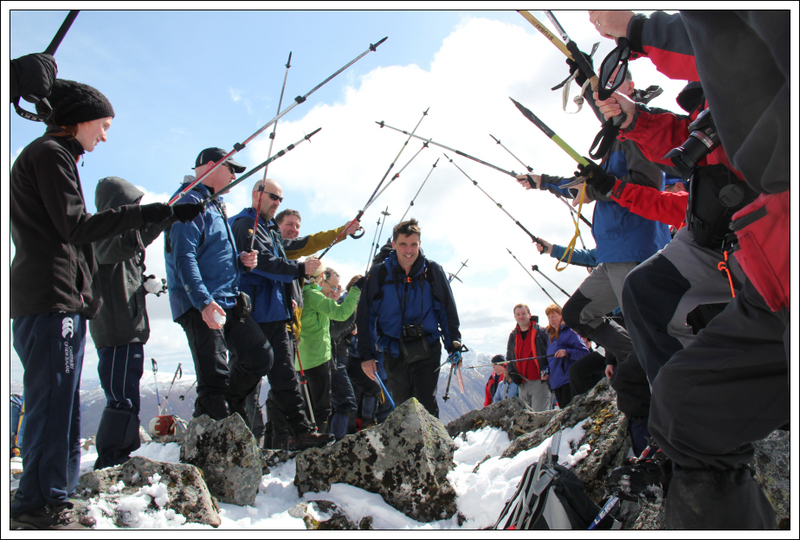 When everyone got word that Hendo was on his way up, the group formed an archway of walking poles creating a corridor for Hendo to walk to reach the summit. The smile on Hendo's face was superb. 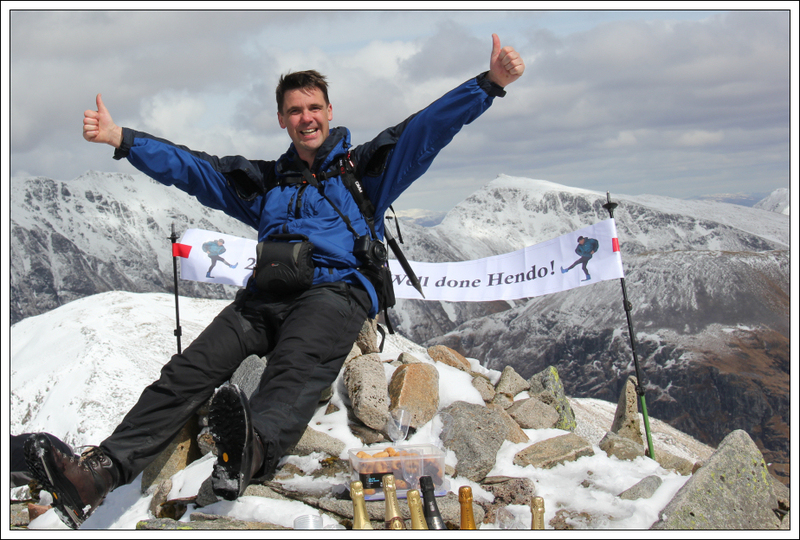 A big well done from myself and thank you for allowing both myself and Beinn to join in the celebrations. 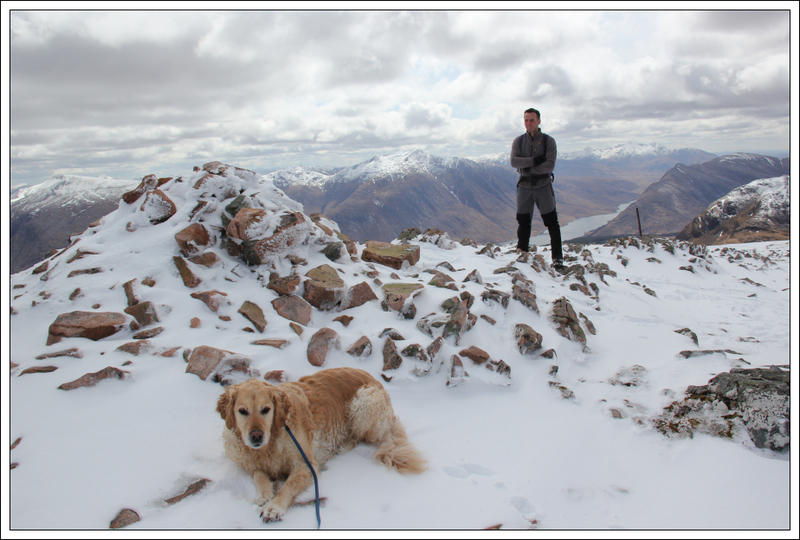 After celebratory drinks at the summit, I opted to head back down the steep slope first with Beinn. 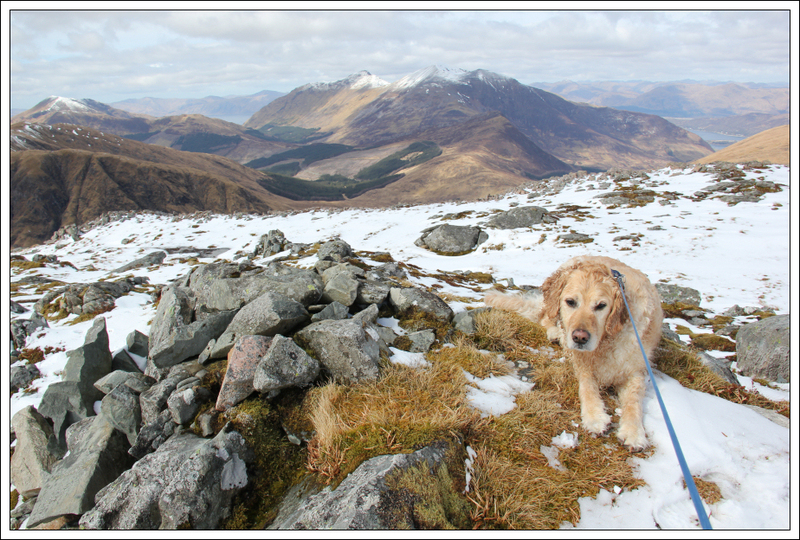 Beinn would quite happily chase a rolling snowball down a hill which is not good whilst attached to him via an extending lead. Saying that if he did catch the snowball, he would take it back to me; typical Golden Retriever! 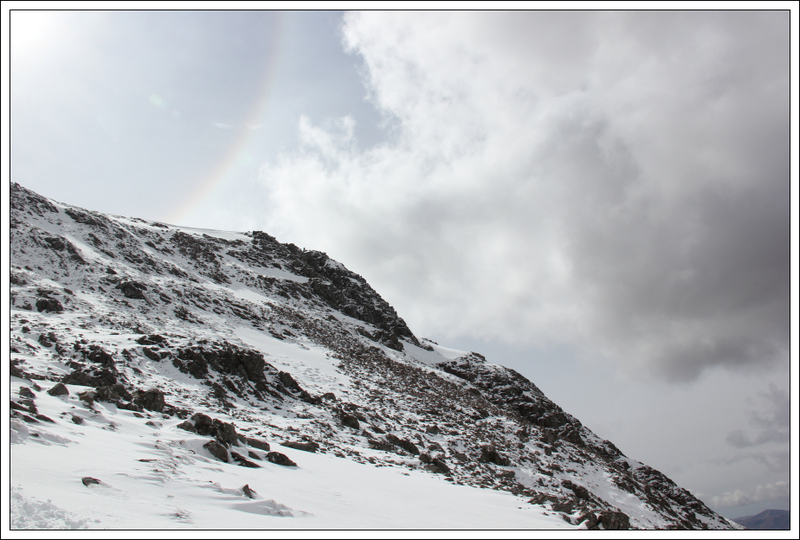 During the descent, it was great to see a full circle rainbow around the sun. The lens on my camera wasn't sufficiently wide-angled to capture the entire effect. 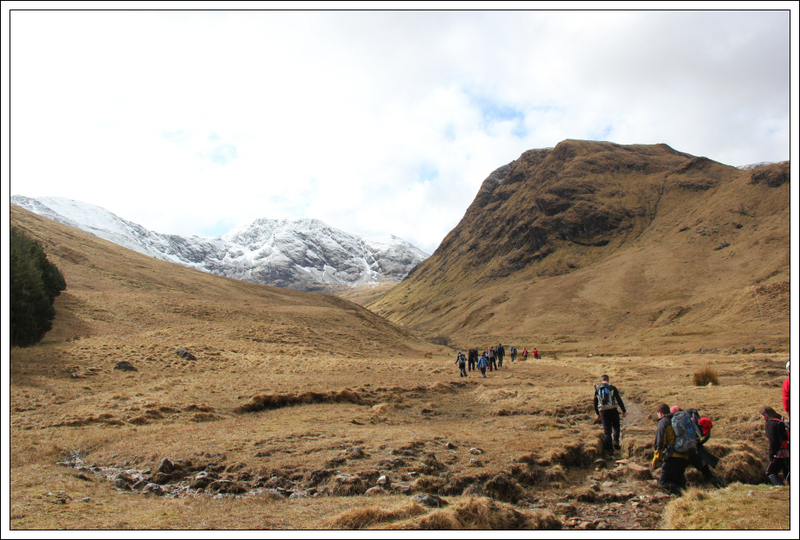 After re-ascending Stob an Fhuarain and then descending back down to the col, I made my way down the steep grassy slopes to Gleann leac-na-mhuidhe. 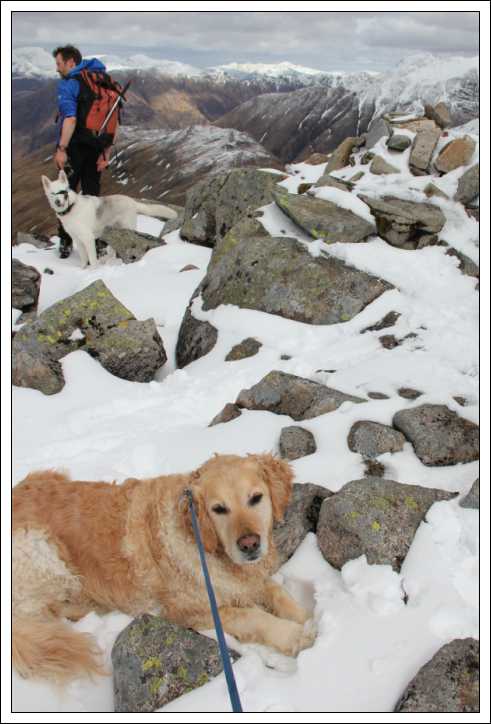 On the way back we had our obligatory stop to allow Beinn to spend some time lying in the burn! Post-walk celebrations continued after the walk back in the Clachaig Inn. 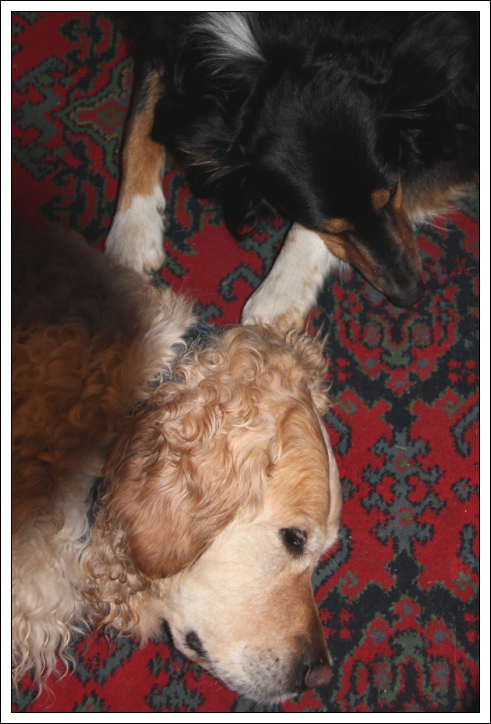 Beinn and Molly seemed to be happy to relax together. A fantastic day out in great company .